Along with our industrial-grade 3D printers, here at WhiteClouds, we have also worked with three consumer 3D printers: the Afinia® H-Series, Cube® 2nd Generation, and MakerBot® Replicator 2. To learn more about these printers, here are our personal experiences. The Afinia H-Series 3D printer is packaged with all the tools needed to successfully print 3D projects: Installation disk, 34-page manual, Quick Start Guide (QSG), two filament spools and accessory pack. The Afinia 3D Printer produces fine-resolution prints that turn out beautifully. We have had some problems with keeping the print bed temperature high enough, which can ruin a print. However, we have found that placing a cardboard box over the Afinia printer and preheating the print bed for approximately an hour solves this problem. Getting the Afinia off the ground took some patience but after fine tuning and learning its quirks, it has been a dream to work with. With those early experiences, we’ve been able to write a fair amount of troubleshooting tips that will help you with any problems. Regarding tech support, overall our experience with Afinia has been positive. They have always been knowledgeable about the different issues that we have called them about. Also, they have been willing to take the time to talk us through the steps to a repair or fix the printer in-house. Overall, the Afinia® is a good 3D printer that produces fantastic prints, ideal for tinkerers. The Cubify Cube 2nd Generation 3D printer includes: User guide, print pad, 1 PLA plastic filament cartridge, Cube tube, Cube stick, USB stick, power cord and 25 free model files. The Cube® 3D printer is a very user-friendly printer and focuses on ease and usability. Within moments of having all the parts pulled out of the box, we were able to print our first creation. Out of the three printers, the Cube is probably the easiest to use overall. One problem we’ve had is that the nozzle clogs occasionally and causes filament flow errors. We have remedied this by thoroughly following every step when changing the filament. The Cube requires filament cartridges and the cost is more expensive than other filaments. However, for the beginner, the Cube is well-worth the extra cost in filament. Tech support for the Cube has been helpful and positive. The agents were knowledgeable and went through a checklist to solve an issue until we had reached the final solution. 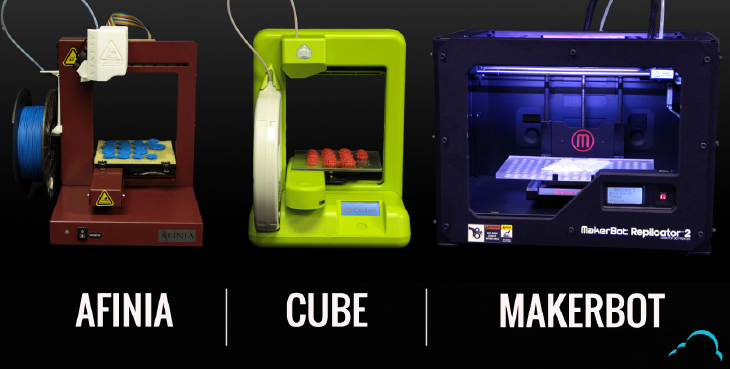 The Cube® is a great choice for beginners who are looking for an, easy-to-use 3D printer. The MakerBot Replicator 2 3D printer comes with: Instructions, Allen wrenches, MakerBot PLA filament, power cord, USB cord, blue painter’s tape sheets and a technical support card with contact information. MakerBot hosts a website called Thingiverse where you can download STL files for free and 3D print them. MakerBot creates fine prints and comes with MakerWare software. MakerWare has options that allow you to scale, arrange, and rotate the object on the build plate along with several other features. MakerBot had print flow problems that led to skipped or breakable layers. This seems to be a common issue based on the MakerBot forums we’ve read. We upgraded the extruder, which was provided for free by MakerBot, and we keep the extruder clean and perform regular maintenance to solve this problem. We especially like the large build plate and versatility of the MakerBot. It allows for more customization options that other consumer printers. The MakerBot email technical support team is knowledgeable with a turn-around of one or two days and has helped us solve our problems. MakerBot offers the MakerCare Service Plan for an additional charge, which includes such benefits as free replacement parts.